Being the director of a single marque car club doesn�t mean only going to Ford events. I find it refreshing to sometimes go to a show for cars that I find interesting, but don�t own � it�s kind of a �Beginners Mind� experience. And to some extent I can see myself in the busy event organizers. 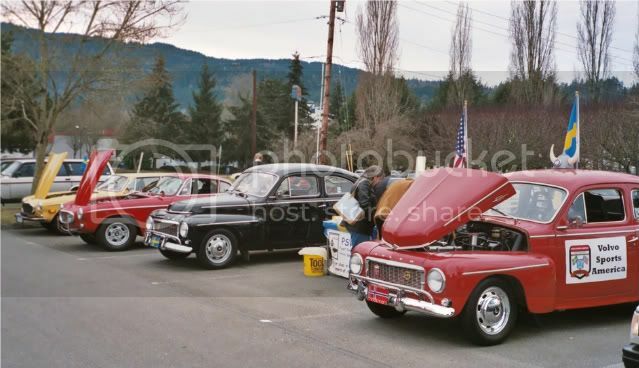 Last weekend Judy (E-Ford Lines editor), her husband Kevin and I went up to Issaquah, east of Seattle for the annual Swedish Car day at the auto themed Triple X Drive In (the sign on the door says �Nothing here is good for you�). There were about 200 (which is hard to believe) Saabs and Volvos on site. Interestingly enough, the vast number of cars were from the 80�s and 90�s, with maybe 10% being from the 60�s and 70�s. 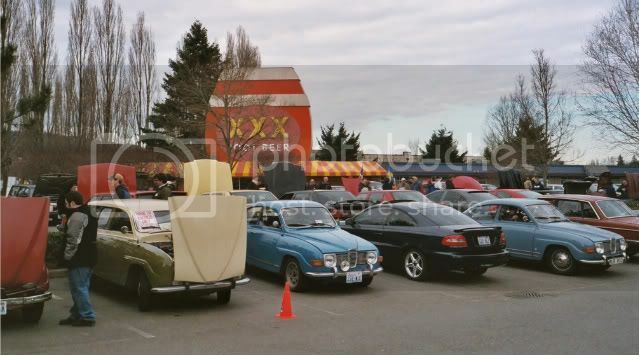 I kind of wanted the check out the Triple X as I have thought it might be a good venue for a Puget Sound Region Euro-Ford gathering. In order for it to work, the Merkur folks would need to show up in mass, as there just are not enough other Euro-Fords around to reach a critical mass (maybe I�m wrong about that). Sorry we missed a chance to get together. had a good turn out.